As 2018 BHS graduates have made it through their first semester at college, they are now ready to offer advice and experiences on this tough decision to current high school students. Audrey Brewer is a freshman at Gordon College. Brewer knew she wanted to attend a smaller school. Size was one of the biggest deciding factors for her, along with the ratios of students to professors, females to males, and majors. “A big component for me was if it there was a faith-based community and whether it was on campus or off,” said Brewer. She expected it to be a challenging adjustment, but found it easy to make friends, get into the right groove, and found solace with upperclassmen who are “so generous and helpful.” Brewer advises that students “Be open; Open to friendships, majors, clubs, ideas, and everything.” She also encourages students to focus on themselves and to make time to relax. Brewer noticed that a huge difference between high school and college is the motivation to learn. “The students actually care about what they’re learning because you get to choose what you want to learn you are more apt to do better and dig deeper,” said Brewer. She also warns about the expenses of everyday needs like snacks, books, and toiletries. “My best advice with money is to figure out your needs and your wants because of a limited budget at school,” said Brewer. “In the end, [Gordon College] was where I felt most called to go. There were so many signs pointing there that it ended up being obvious. The signs may be small and simple but you’ll know them when you see them,” said Brewer. Amanda Pfautz, another 2018 graduate, now attends Emmanuel College. Pfautz decided on Emmanuel because of the “combination of money, location, and opportunities,” it offered. “[Emmanuel] is right next to a lot of really amazing hospitals and I have a ton of opportunities I wouldn’t have had elsewhere,” said Pfautz. The ‘feel’ of the school was important to Pfautz. She knows most of the people in her classes and feels that her teachers know her. She also feels that the college workload is what she expected. “The actual workload wasn’t very different; the courses just move at a much quicker pace,” said Pfautz. She advises incoming college students to buy their books online. “I found my $350 bio textbook online for $5,” said Pfautz. 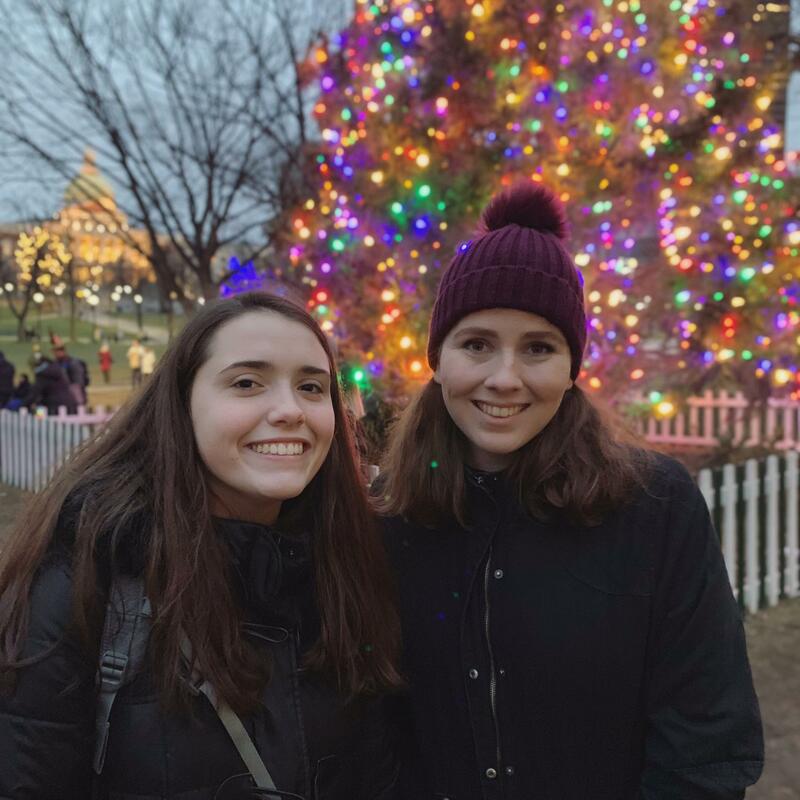 She then studies for a few hours before going to her lab from 4-7 p.m. Pfautz admits that, “the first week was definitely hard,” but that “once you get to know a few people and can go places or do things with them it becomes much easier”. “When choosing a school I’d say the most important thing is just to be genuine and know yourself,” said Pfautz. For Westfield State Freshman Drew Dalton, money was the biggest factor, “I didn’t want to graduate with a lifelong debt to pay,” said Dalton. He chose Westfield State because of the scholarship money, the Criminal Justice program, and club opportunities. He “also had a number of teachers who were WSU grads who [he] really looked up to,” and he had heard only good things about Westfield State. For Dalton, it has been a pretty easy transition. He “quickly realized that [his parents] had prepared [him] well for the real world,” said Dalton, who noticed that kids who didn’t know how to do things such as laundry and making beds struggled at first. Dalton also feels that, along with his parents, high school prepared him well for college. He also said that in college you have to learn how to live and work with other people. In an average day, Dalton wakes up around 9 or 10 a.m.and goes to classes until 3 p.m.. He then participates in extracurriculars and does homework until about 7 p.m., then he hangs out with friends. “I also slip meals in there sometimes,” joked Dalton. Dalton is able to participate in many extracurriculars that he wasn’t a part of in high school, such as Ultimate Frisbee, EMS Club, hall council, and Residential Housing Association. He also was able to continue some high school interests, like the Student Government Association, Class Council and SCL, the college level JCL. “My biggest piece of advice is to befriend upperclassmen, they generally know what is going on and can be very helpful with choosing classes, finding things on campus, et cetera,” said Dalton. He also recommends not being afraid to ask for help, “your RAs will always help you or direct you to someone who can help you with almost any problem,” said Dalton.